In December 2006, Zuffa purchased WEC. With the purchase, WEC continued as a separate promotion with its own roster of fighters. Adams was retained after the purchase as the organization's matchmaker. Harris and Adams were named co-General Managers and were both active in the new WEC. In 2008, Sean Shelby was named the new match-maker for the promotion by Zuffa. Zuffa made several changes to the promotion after the purchase. It discontinued its pentagonal cage for a modified version of the UFC's octagonal cage. The championships of fighters who were contracted UFC fighters were vacated. The promotion moved to focus on lighter weight classes, abandoning their heavyweight and super heavyweight divisions and championships, and retaining their bantamweight and featherweight divisions—two divisions not then present in the UFC. After the purchase, several WEC events were held in Zuffa's hometown of Las Vegas, Nevada, much like the UFC. WEC aired their events live on Versus (formerly known as the Outdoor Life Network and now as the NBC Sports Network) in the United States and on TSN (and later The Score) in Canada. WEC's first live event was broadcast on June 3, 2007 on Versus from The Joint at the Hard Rock Hotel and Casino in Las Vegas. WEC announced that it would dissolve their light heavyweight and middleweight divisions after their December 3, 2008 event to further their concentration on lighter classes. Fighters from the light heavyweight and middleweight divisions started fighting in the UFC after the dissolution of their divisions. Also, on February 3, 2009, WEC officially announced the creation of a 125 lb (57 kg) flyweight division and the dissolution of its welterweight division (flyweight would have been the last division under the "Unified Rules of MMA" to be activated under Zuffa, excluding Super Heavyweight). 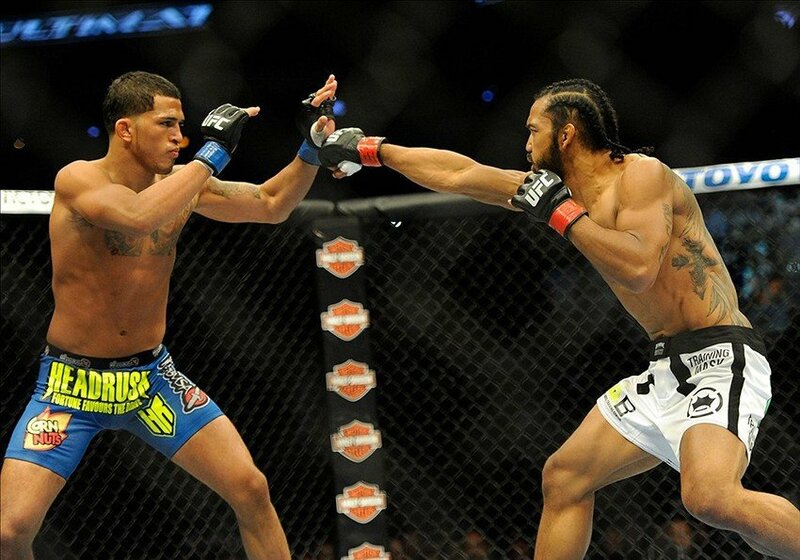 Fighters from the welterweight division started fighting in the UFC after the dissolution of their division. The only weight class that still crossed over between WEC and the UFC prior to the merger was the 155 lb (70 kg) lightweight division. On April 24, 2010, WEC held its only pay-per-view event, WEC 48, which featured two championship fights. The main event featured WEC Featherweight Champion José Aldo defending his title against former champion Urijah Faber. On October 28, 2010, UFC President Dana White announced that WEC would merge with the UFC. Due to its shared ownership under Zuffa, fans and commentators had continually speculated about a unification between WEC and the UFC, particularly the lower weight classes. The relationship between the WEC and UFC had also been complicated by their respective primary partnerships with cable television channels, Versus and Spike, Fight Magazine reported. On October 28, 2010, Dana White announced the merger with the UFC. ^ Savage, Greg (January 4, 2007). "The Savage Truth: When is a Loss a Win?". Sherdog. ^ Martin, Damon (August 26, 2008). "WEC shuts down 205 & 185-pound weight classes". MMAWeekly.com. Retrieved August 26, 2008. ^ "WEC axes welterweights; announces flyweights". MMAWeekly.com. February 3, 2009. Retrieved May 1, 2009. ^ "UFC has weight-and-see attitude for WEC - USATODAY.com". www.usatoday.com. ^ "A UFC-WEC merger? Why not?". cnn.com. ^ "Is there room in MMA for the WEC?". ESPN.com. October 4, 2009. ^ "With UFC's Recent Moves, White's Predictions Might Have Been Conservative". fightmagazine.com. ^ Ariel Helwani (October 28, 2010). "Exclusive: Dana White Announces UFC-WEC Merger" – via YouTube.